The best photographs from conflict zones jar our conscience, cultivate our empathy, and galvanize us to action. Our world, though, has become hyper-saturated with images of carnage and destruction, and most of us have become inured to their power. Photographs of the Israeli-Palestinian conflict, though often contested, are no exception. The spectacle of the conflict, delivered at an ever-accelerating rate, has become mundane. Yet every once in a while something manages to arrest our attention and penetrate our stoicism. Such is the case with a photograph taken by Shaul Golan of a frightened Israeli policewoman who is shielded by two Palestinians during a violent confrontation in the West Bank. The photograph is both unique and surprising. An Israeli authority figure, a symbol of power, is shown in a moment of vulnerability. Paralyzed by fear, she cowers down, fists clenched, looking helpless and childlike. Two Palestinians stand by her side. Their arms are open. They hold no weapons; just a cellphone to bear witness. Their faces are marked by an unyielding determination and dignity. According to reports, the altercation took place near the Palestinian village of Qusra (Area B in the West Bank) when a group of Jewish settlers from the outpost of Esh Kodesh (“Holy Fire”) attempted to interfere with Palestinian farmers from working their land. As the matter escalated, security forces (army and police) were called in. After the police began using force (taser guns) to arrest and disperse the agitated crowds, some of the Palestinians started throwing rocks at the Israeli targets. The army responded with their standard aggressive crowd dispersal techniques. Meanwhile, the female police officer in the photograph got stuck in the middle, became frightened and froze. 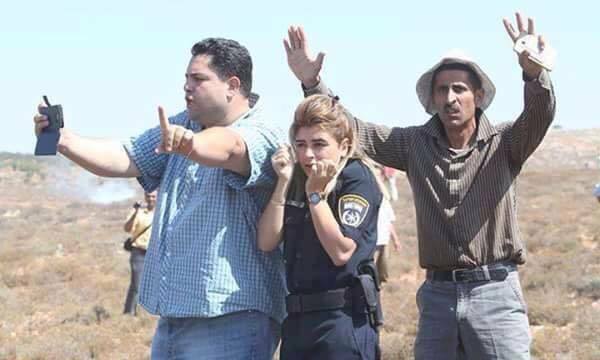 Seeing she was in trouble, a fellow Israeli officer prepared to fire in the direction of the Palestinians. At that point, the two Palestinians in the photograph stepped forward and repeatedly shouted, “Don’t shoot! We will protect her.” The one pictured at the right is Zakaria Sadah, a field worker with Rabbis for Human Rights. The other is the (unidentified) mayor of Qusra. Together, they escorted the shocked officer back to the security forces. Indeed, it was an extraordinary act of courage and compassion — especially when you consider the social cost for Palestinians who stick their necks out for an Israeli in uniform. What a stark and powerful contrast between this act of humanity and the cowardly violence we have recently witnessed here. One protects an enemy from harm, while the other burns a baby in his home. The potentially iconic image contains a profound truth: it is through acts of extraordinary moral and physical courage, grounded in principles of equality, interdependence, and non-violence that we begin to know justice and peace. It’s a fitting wish. Even though a photograph snatches a moment in time, peace is and will always remain a dynamic process of becoming. It’s though such actions, and through them alone, that hope is born for a better future. 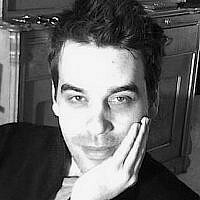 Roi Ben-Yehuda is a lecturer at Columbia University and John Jay College of Criminal Justice. He is currently working on his doctorate from the School of Conflict Analysis and Resolution at George Mason University. Roi holds MS and MA degrees from Columbia University and the Jewish Theological Seminary respectively, and completed his BA degree at New School University. Roi’s articles have been featured or quoted in publications such as the New York Times, Huffington Post, The Daily Beast, Haaretz, Jerusalem Post, Al Jazeera, France 24, The Forward, 972 Magazine, and The Epoch Times. His work has been translated into multiple languages including: French, Spanish, Portuguese, Arabic, Hebrew, Urdu, and Indonesian.